The Dutch state broadcaster NOS has reported a Royal Netherlands Air Force F-16 Fighting Falcon aircraft literally ran into its own rounds in January during an exercise over Vlieland. According to the Dutch Broadcast Foundation, the incident occurred during the January exercise at the Leeuwarden air base, but information about it appeared only now. January 21, two F-16 fighter jets took off and opened fire on targets at the test site. The pilot of one of the F-16 fighter jet aircraft had flown into his own stream of cannon rounds and later suffered considerable damage. 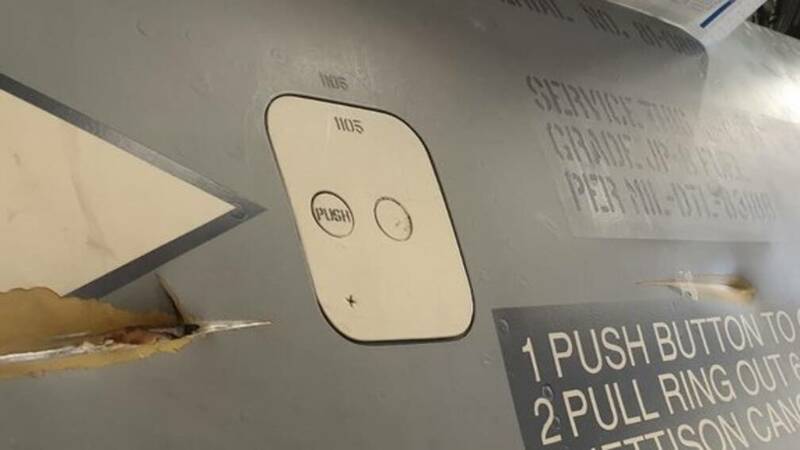 At least one fired round caused damage to the exterior of the aircraft. Parts of the munition also ended up in the engine. Nobody was hurt during the incident. The pilot followed emergency procedures and was able to land the fighter jet safely at Leeuwarden Air Base. Run into its own rounds? I think it's either a faulty barrel or the gun misaligned itself and the jet shot itself - this is how it's looks like. Apparently it's happened once before in 1956 on a F11F Tiger in a steep dive which reconnected with its ammunition. Examination of the F11F established there were three hits—in the windshield, the right engine intake, and the nose cone. The engine's inlet guide vanes were struck, and a battered 20mm projectile was found in the first compressor stage..
How did this happen? The combination of conditions reponsible for the event was (1) the decay in projectile velocity and trajectory drop; (2) the approximate 0.5-G descent of the F11F, due in part to its nose pitching down from firing low-mounted guns; (3) alignment of the boresight line of 0° to the line of flight. 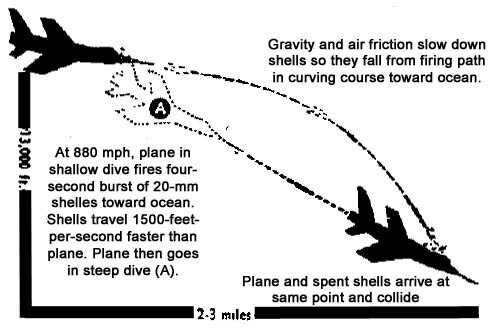 With that 0.5-G dive, Attridge had flown below the trajectory of his bullets and, 11 seconds later, flew through them as their flight paths met. Based on how the F-16 employs the gun I think it’s highly unlikely it ran into its bullets the same way the F-11 did. A gun malfunction or getting hit with its own ricocheting bullets are much more likely if I had to guess. In the early 1985-1990 period, I don't remember the year. The month was Mei, pretty sure as we always went in Mei early June. The Gun malfunctioned and shot a bullet right into its OWN cockpit. The bullet was recovered in the throttle quadrant area. Let them contact Belgian Air Force, there must be traces of that incident somewhere. Flight safety officer was Cdt Sprengers => I gave the recovered bullet to him. Looks more like a misaligned gun than anything else. Hmm. Or possibly an unstable round or two. Look at the damage - if the barrels were misaligned, I suspect it would look different. krorvik wrote: Hmm. Or possibly an unstable round or two. Look at the damage - if the barrels were misaligned, I suspect it would look different. Didn't cross my mind,yea in that case the bullets would have totally shredded the aircraft. OK, Does he get credited with a "half star"
Another take on the same incident.. The running into its own rounds theory sounds implausible given normal strafing profiles. Unless the round was a dud with not enough/damaged propellant that left the muzzle with significantly less velocity than normal. My take is one round for some reason (bad pipe, bad round) came off unstable - spinning, but not in a stable manner. The damage is below the canopy, right in front of the muzzle. The fuselage is dented in two locations, with a dent *before* a straighter scratch. Single round hits the fuselage in two locations before the fuselage tapers away against the nose. Consistent with that kind of spin - although I havent calculated it against muzzle velocity and spin. krorvik wrote: My take is one round for some reason (bad pipe, bad round) came off unstable - spinning, but not in a stable manner. Fragmented projectile or 'slow burner', as suggested by a Danish Viper pilot.